Our gymnastics coach, CJ Faust, had a 15 plus year gymnastics career as an athlete. He was a 4-year letterman at UC Cal Berkeley, a member of Cal’s 1997 NCAA Division 1 national championship team and started pbars, pommel horse and rings. He was also named 1997 Most Inspirational Gymnast by his teammates. CJ has an award named after him called the Christopher James “CJ” Faust award that is still in existence today. CJ also was a volunteer men’s gymnastics Assistant Coach at Cal from 1998-2000. He went to Diablo Gymnastics School in San Ramon and Cal Bear Rec Club growing up. He was the head coach of the boy’s competitive gymnastics team at Diablo Gym during college (1994-1998). CJ started Crossfit in April of 2011 at Paradiso Crossfit while living in Los Angeles. A former Cal gymnast teammate turned Hollywood stuntman talked him into trying it out with his stunt buddies back then and he hasn’t looked back since. 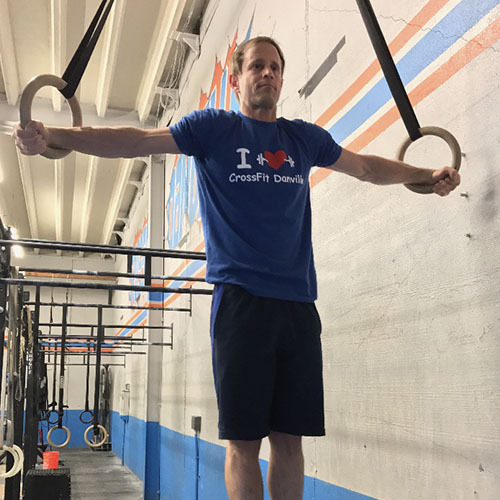 CJ has been an active member of Crossfit Danville since we opened our doors in 2012.